Graphic illustration and forecast of Tropical Storm Isaac as at September 9 2018. 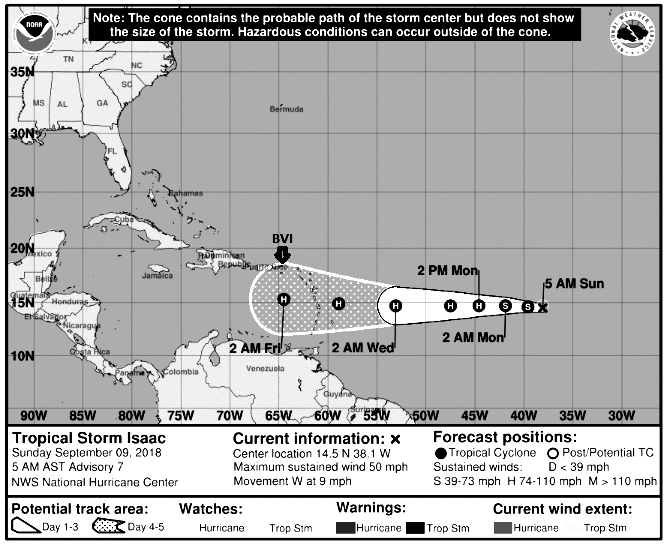 At 5 o’clock Sunday morning, the Department of Disaster Management (DDM) said Tropical Storm Isaac was located near latitude 14.5 north and longitude 38.1 west. Isaac was moving westwardly at nine miles per hour at the time. “Maximum sustained winds remain near 50 miles per hour with higher gusts. Strengthening is forecast during the next few days, and Isaac is expected to become a hurricane by Monday, (September 10),” the DDM said. “Tropical-storm-force winds extend outward up to 60 miles from the centre. The estimated minimum central pressure is 1001 millibars,” the DDM added while urging residents to begin preparations for the possibility of being impacted. BVI News will continue to bring weather updates of these weather sysyems. Let’s hope it loses strength before approaching the islands. The Caribbean is too battered for another storm. We can’t receive another. Why people seem to think that we are immune to hurricanes? Most people said that Orma was just breezing by and look what happened. People need to stop being so naive.